My goodness, its been a while since I’ve baked something, so I’m happy to share this moment with you. The sun was shining through the windows and the kitchen had a warming magnetism, and in my head I could hear a voice saying come on Yvette, get creative and make something delicious for morning tea. So not resisting, I made something that I know the children love as well. The fruit bowl had an overload of apples, so the choice was easy Vanilla Apple Cake. This my friends is a little something, petite isn’t it. It’s a Royal Albert petite china Christmas decoration. Design ‘Old Country Roses’. 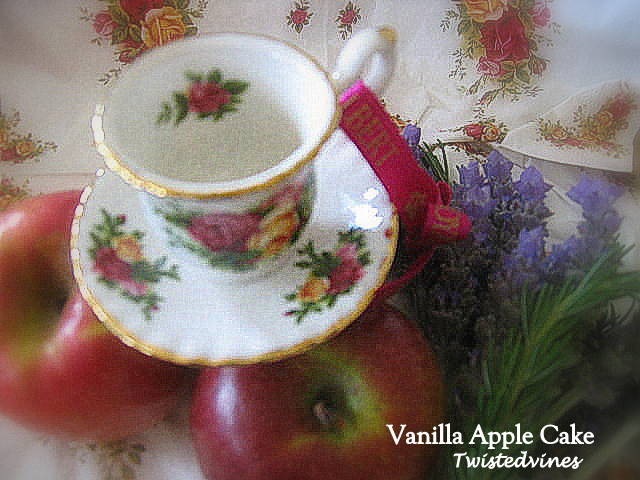 The little cup is actually joined to the saucer and has a beautiful ribbon with embossed gold calligraphy. Can you imagine your Christmas tree decorated with these and full of fairy lights. Peel and core about 4 to 5 apples. I used a mix of Granny Smith and Pink Lady apples. Cook on a moderate heat until softened. Cream butter and sugar until light and fluffy, to get a more fluffy effect I do this by hand,the warmth of your hands gradually melts the butter combining and crumbling with the sugar. Add eggs one at a time ( make sure eggs are room temperature) ,beating well after each addition. Fold in sifted flours. Spoon half the cake mixture into a round 25cm cake tin, and spread evenly over the base. Add hot apple, spoon remaining cake mixture over the apple. As the top cake mixture melts, spread it evenly over and through the apples. Don’t worry if you don’t cover all of it. I then cut thin slices of red apple and swirled a pattern on the top of the cake. Bake in a moderate oven for 35 – 40 minutes or until cooked when tested. 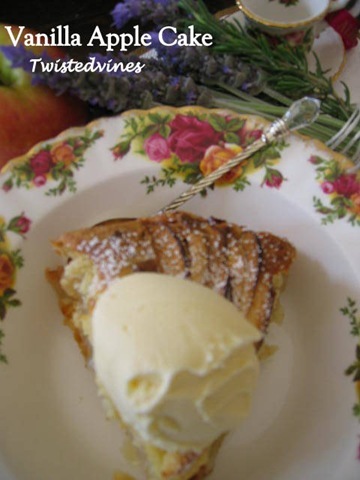 When cool sprinkle with icing sugar and serve with cream, custard or vanilla ice-cream. This serving plate is Royal Albert ‘Old Country Roses’. I love the rose pattern and gold trim. And did you notice I also have official Royal Albert ‘Old Country Roses’ paper serviettes. Just to finish off my morning tea table. 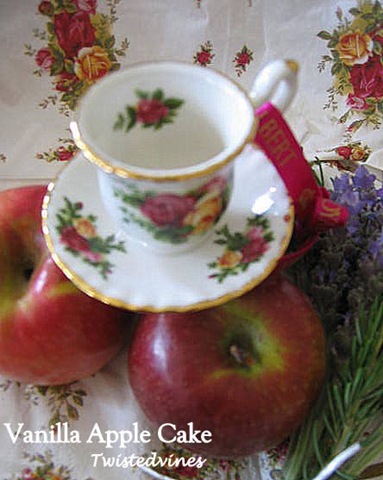 However, we had coffee with our Vanilla Apple Cake this morning, so the petite teacup was just on show. Taking front position on the serving tray, of course. The Vanilla Apple Cake was served in Royal Albert ‘Old Country Roses’ dessert bowls with vanilla ice-cream. 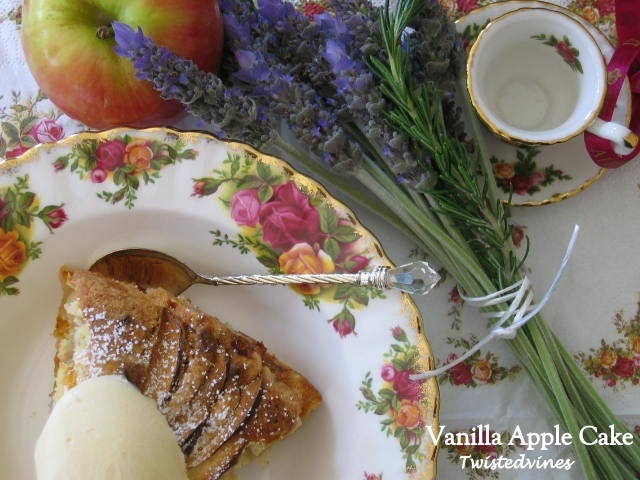 My table was set with shiny Pink Lady apples, the perfume of freshly picked lavender and rosemary twigs. 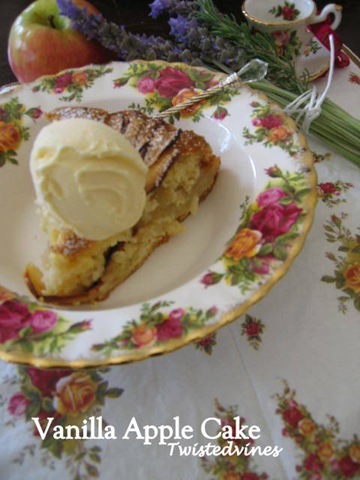 This Vanilla Apple Cake is a wonderful recipe, fluffy, moist and just enough sweetness, and a beautiful perfume with the added vanilla. A wonderful addition to any morning or afternoon tea. Something special to share with friends. That little teacup is adorable! hmmm, that Apple cake looks really fantastic. So decorative and scrumptious. You are a perfect baker. And Royal Albert Old Country Rose is one of my beloved patterns. The happy colors are perfect with apples. The tiny cup is sweet but I see, you own a lot of pieces, too. Thank you for this delight ful tea time with the delicious cake. 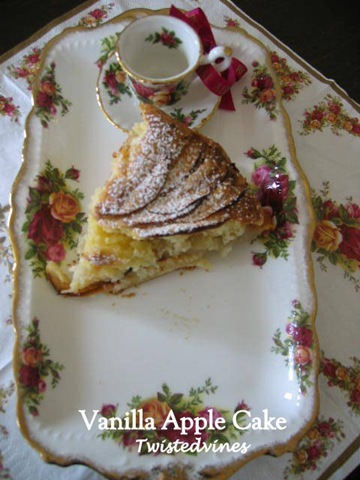 Johanna, thanks for calling by, this vanilla apple cake is one of my favourite recipes..and so easy. It truly makes a statement for any morning or afternoon tea! Thank you, for calling by. Sharing my favourite recipes and have morning tea with friends is always a great way to start the day! Yvette, what a treat it must have been sharing tea with you today with this lovely apple cake and as always so beautifully photographed. 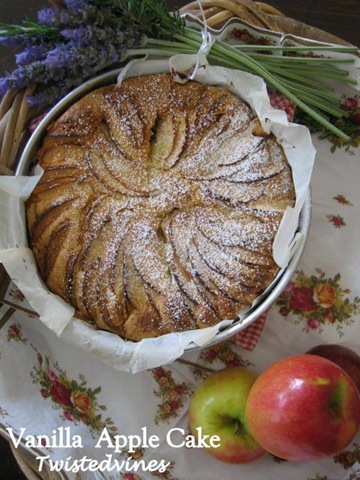 Scrumptious looking apple cake, and you have set it up so nicely for the photo. Thank you Millie.Have a great day! Oh my your dessert looks so delicious. And what a lovely way to serve it. Beautiful! It was delcious…served warm with a dollop of french vanilla ice-cream and a scattering of icing sugar. All I can say it wow… I really believe this cake is for me lol. I LOVE this Vanilla Apple Cake. I’ve never heard of it but that won’t stop me from making this. And I LOVE the ice cream on top.. delish! 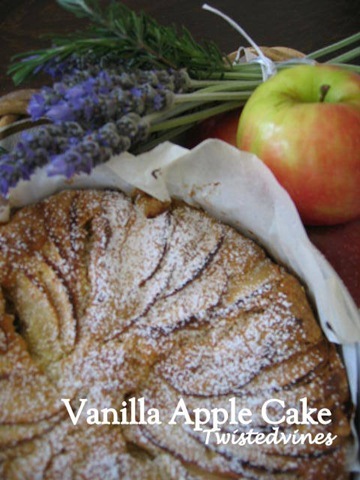 Hi Yvette~ Your Vanilla Apple Cake looks delicious…I love your little apples slices decorating the top! Your Old Country Roses is such a lovely old-fashioned & feminine pattern~ I love your petite tree ornament! I would be so fun to have a collection of those tiny teacup ornaments hanging from a chandelier or light fixture in the kitchen for the holidays! Hi Mary, lovely having you stop by. A wonderful idea to have a chandelier filled with the petite teacup decoration..can only dream of this one. I also have a bauble in ‘old country roses’ china, but would need some time to fill that christmas tree.! Yvette! How sweet of you to visit me and share such kind thoughts at The Writer’s Reverie! I’m drooling over your apple cake – a personal favorite – but I’m gluten free these days and would need to substitute ingredients. Hope you’ll stop by again – I want to see about more on your recipes . . .
Oh My! 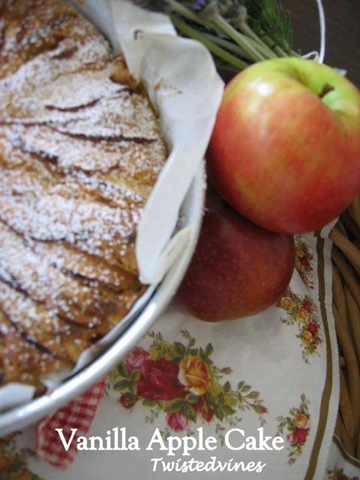 It has been such a long time since I have baked anything yummy in the kitchen, as well–That Apple Cake looks so yummy! I may just have to venture into the kitchen soon–your space here is so lovely–loved my visit. Yvette – what a delicious looking dessert. Even if it were without your marvelous presentation, it would have me salivating. Though I’m a reluctant cook/baker, I just may have to give this a whirl! 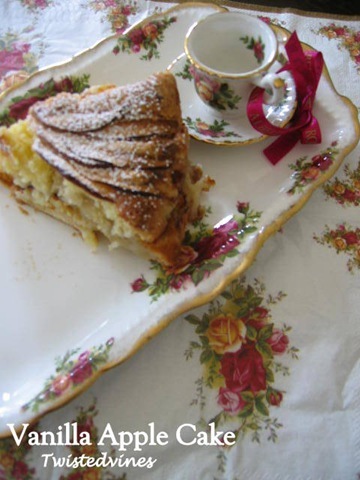 Especially since I have a few Royal Albert dishes on which to serve the delicacy. Yvette, that looks and sounds sooo yummy!!! Actually it looks beautiful, like something in Country Living magazine. Thanks for the recipe! I love apples and this looks so yummy and just in time for the approaching season of autumn. Happy to have you with us on Teacup Thursday. I’m sorry I’m late visiting but we had a family emergency this past week and I’m longer making my rounds. 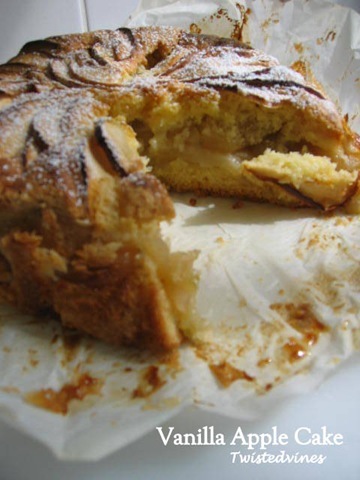 Oh my, what a tempting treat your apple cake is! Thanks for sharing the recipe. Your little teacup ornament is darling and I love hanging little teacups on a tree myself. Such a lovely tea post. Thank you for sharing this with Tea Time. Enjoy your weekend and thanks for joining me for tea. You’re welcome any time. This cake looks divine — thank you so much for sharing the recipe! One question: you call for cornflour in the ingredients list… is that finely milled, like regular flour? We have cornmeal, which is a bit more grainy in texture, but I haven’t seen cornflour in the stores. Maybe I can grind cornmeal in the processor…. I can’t wait to try it, in any case!!! !